We provide comprehensive dental services with a focus on patient-centered care, working to fulfill the needs of patients regardless of their dental health circumstances. Dr. Rappleye approaches his craft with a strong desire to perform dentistry with excellence, and takes this obligation seriously. With more than 30 years of dental experience, he uses his knowledge and skill to help patients achieve their optimal dental health. We are proud to offer exceptional dental care to the communities of Hoffman Estates, Schaumberg, Streamwood, Hanover Park, South Barrington, and residents of the surrounding communities. Whether you need a simple checkup or a full dental restoration, the dental office of Dr. Rappleye is here to help you. Contact our office and schedule an appointment today. We serve family members of all ages and provide services to meet a variety of needs. Dr. Rappleye works directly with each patient, giving an individually tailored experience at every visit. He is happy to consult with you to determine your dental needs and address any questions or concerns you may have. We strive to make ourselves available to you when you need us. Our office provides a 24/7 emergency line, where you will speak to a real person, not an answering machine. If you have a dental emergency and need immediate care, we will make every effort to see you as soon as possible. Our office specializes in providing high-quality dental restorations. From crowns and bridges to dental implants, we can help bring new life to your smile, so you can enjoy ideal dental health. Dr. Rappleye approaches each consultation with the goal of assessing the state of your current dental health and determining the most effective course of action. He takes the time to inform you of all options, allowing you to consider your choices and make the decision about which treatment plan is the best fit for you. In Dr. Rappleye’s care, you can be confident that you will be able to eat, speak, and smile with confidence. At Dr. Rappleye’s office, we are dedicated to ensuring that you and your loved ones receive the best possible dental care. Come visit us at our convenient Hoffman Estates office, located in the Northwest Corporate Center on West Higgins Road. We look forward to serving you! 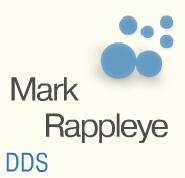 Hoffman Estates dentist, Dr. Mark Rappleye is a dental professional dedicated to cosmetic and restorative dentistry with service including clear braces, zoom teeth whitening, and much more.